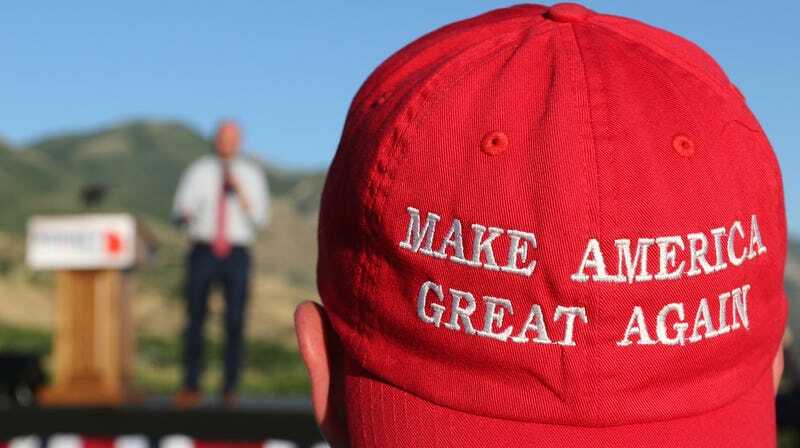 A Romney supporter listens to a speaker as he wears a ‘Make America Great Again’ hat at the Mitt Romney election party on June 26, 2018 in Orem, Utah. Because we’ve apparently learned nothing and are doomed to relive the same news cycle over and over, Yelp has once again become the home for airing political grievances. This time, a Canadian restaurant was made the target of negative reviews after the manager asked a man in a “Make America Great Again” hat to leave. According to the CBC, the restaurant in this incident was the Teahouse in Stanley Park, a popular tourist restaurant. And like the Red Hen before it, the business received wave after wave of one-star reviews after manager Darin Hodge refused to serve a man wearing Trump’s signature hat. Here’s how the whole thing played out, per accounts provided to the CBC: A man wearing a MAGA hat came into the restaurant and was seated on the patio. Hodge, the floor manager for the shift, confronted the man and asked him to remove the hat. The man refused, saying he had a right to wear it. Hodge informed him that he wouldn’t be served if he wore the hat, so the man left. While that seems like it should be the end of the story, it, of course, isn’t because on the internet, nothing is an isolated incident. Once word got out that a man in a MAGA hat was refused service at a restaurant, the Trump backers showed up in full force to the Teahouse’s Yelp page, armed with one-star reviews. Of course, when the Trump supporters show up, so does the #Resistance. The same thing happened when the Red Hen asked White House Press Secretary Sarah Sanders to leave last weekend, and the restaurant’s Yelp page turned into a battle of dueling reviews. In this case, though, the folks who align themselves against Trump also started posting one-star reviews—not for the restaurant kicking out the man in the MAGA hat, but for firing the manager who made the decision to refuse service. Anyway, the Teahouse’s page is in cleanup mode as Yelp works to remove all of the politically charged reviews. So congratulations to everyone involved: you accomplished nothing at all, other than to make the job some poor moderator at Yelp a little harder than it needs to be.